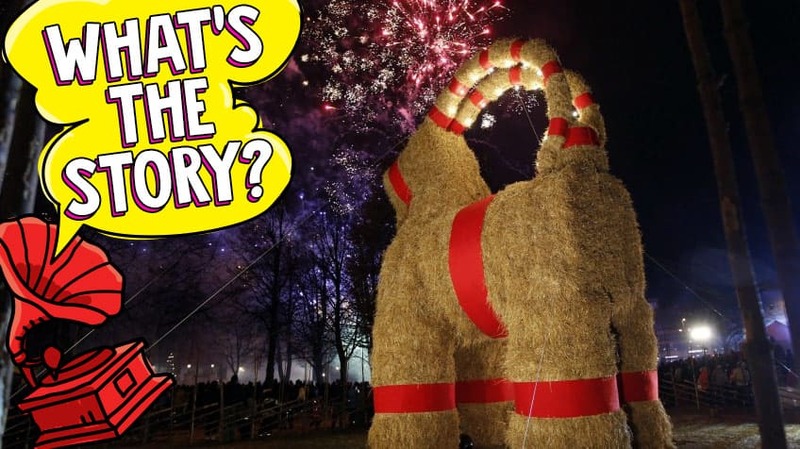 Every year in Sweden, a town celebrates the start of the Christmas season by putting up a giant straw statue of a goat. Then they wait—and sometimes even bet—on whether the goat will make it to Christmas. Because the town of Gävle [say: yeah-vleh] has another, very different, Christmas tradition: every year someone tries to burn down the goat. 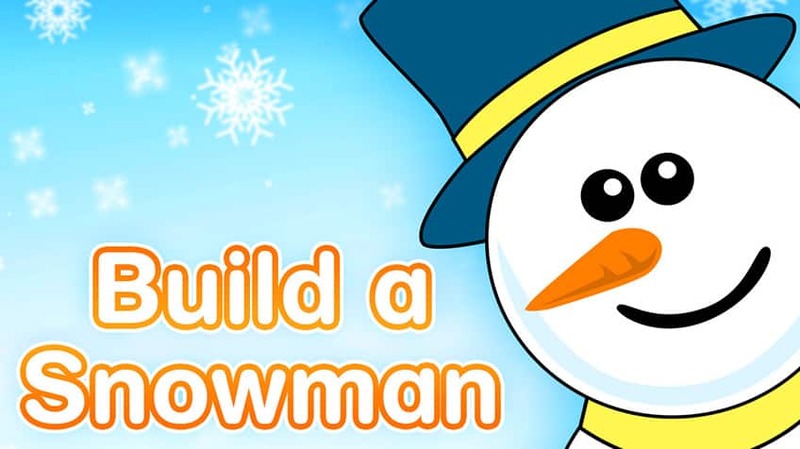 For hundreds of years, people in northern Europe had big festivals in December called Yule. Those traditions became part of Christmas celebrations in places like Sweden. One of those traditions was the Yule goat. The Yule goat was supposed to help deliver presents, so sometimes Santa Claus would ride a goat instead of his sleigh! 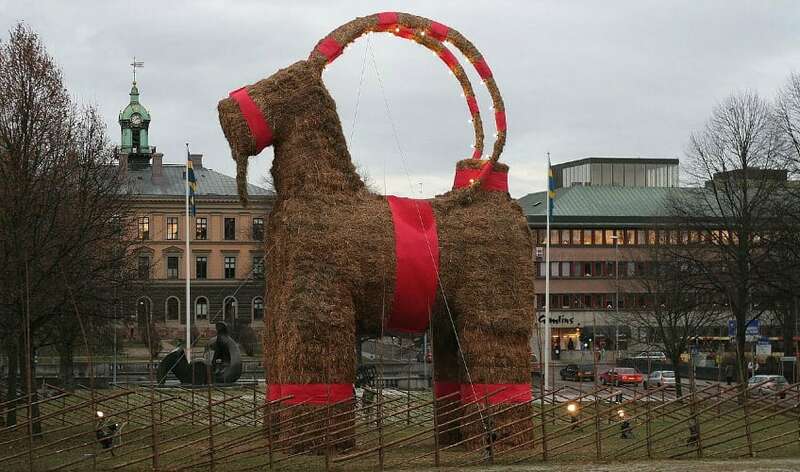 (In fact, small goats made of straw are still one of the most popular Christmas decorations in Sweden.) So in 1966, when the town of Gävle wanted something fun and Christmas-y for the town square, a giant Yule goat seemed like a great idea. It wasn’t. Maybe it also wasn’t the best plan to make the giant statue out of super-flammable straw. 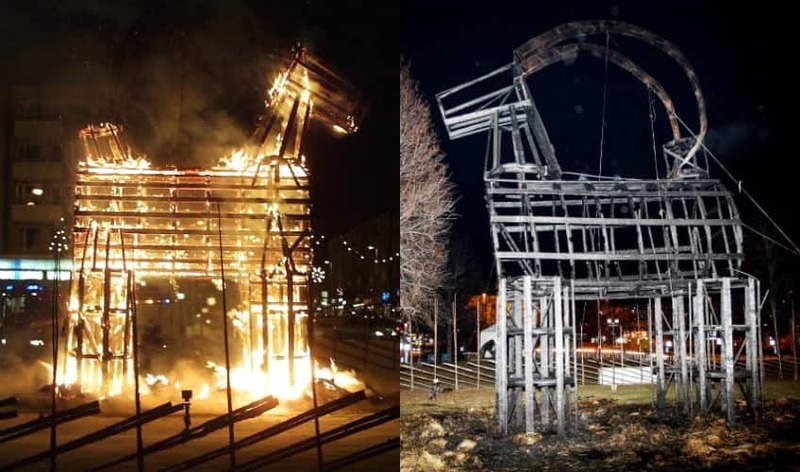 Still, the first Gävle goat actually made it all the way to New Year’s Eve before being burned down, but goat statues in other years haven’t been so lucky. In the past 50 years, the Gävle Yule goat has been destroyed 35 times! The town has tried lots of different ways to protect their goat. They’ve had guards stationed, security cameras put up, fences raised, and the goat itself has been sprayed with water and flameproof chemicals. Some years the goat even survives the whole holiday season! But most years… it doesn’t. In 2005, a group dressed as Santa and some gingerbread men fired flaming arrows into the goat. In 2009, hackers disabled the security cameras and were able to sneak in and set the goat on fire. An American tourist was arrested for burning down the goat in 2001, but he said he’d been told by his Swedish friends that burning the goat was okay—he ended up spending two weeks in jail. Sometimes it’s not even fire that gets the goat. In 1976, someone drove a car into the back legs of the statue and it collapsed. Then in 2010, a security guard reported that he’d been offered a bribe by 2 men who were going to use a helicopter to fly away with the goat. The guard turned down the bribe, so we’ll never know if the goat-napping plan would have worked. Why not give up on the goat? The town of Gävle is stubborn. Over the years, they’ve been urged to stop building the goat, or at least stop using the traditional straw. But they’re proud of their Yule goat. It’s been in the Guinness Book of World Records—for its size, not the fires—and every year in December lots of people visit to see the goat and take part in the Yule time celebrations. Part of the reason people come may be to see how long the goat will last, and some suspect that the town secretly likes all the attention. Still, every year they promise that this goat will go the distance. 2016 was an extra-big occasion—the 50th anniversary of the first Yule goat statue. On the day of November 27, the statue was unveiled. By that night it was up in flames. 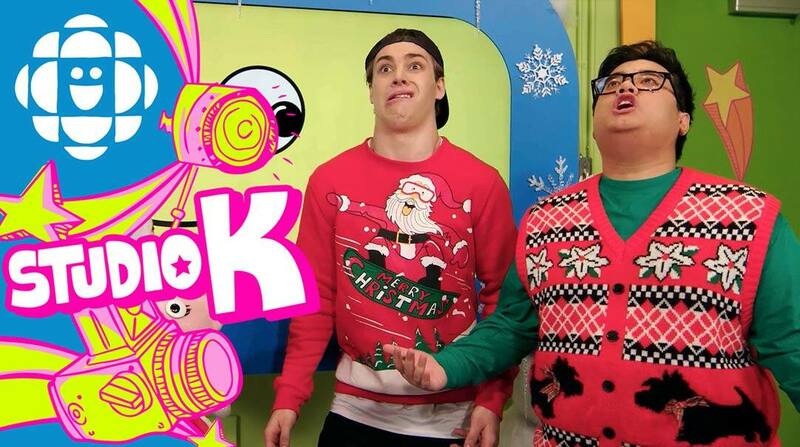 Better luck next year, Yule goat!